A magnificent barred owl scans the world from his pole. As many Suffield residents have noticed lately, this winter has brought with it an influx of barred owls. It’s been a treat to have an opportunity to observe owls so easily when most of us had rarely, if ever, seen one! Just a word of caution- when watching owls or taking photos, be sure to stay well back. If you’re taking a photo with a cell phone, it’s very likely you’re too close. Ethical birding means not disturbing the bird or “flushing it”. 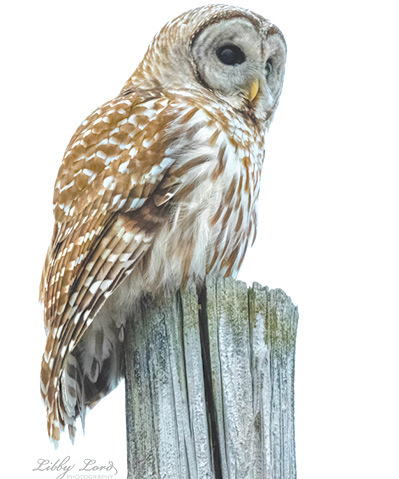 According to DEEP and other resources, barred owls are in danger of starvation, due to the high number of owls, and the low number of rodents this season. Since they have very few calories available it’s dangerous for them to use precious energy fleeing excited photographers. It also interrupts their hunting, which right now is crucial for their survival. So it’s best to use a long lens and if possible, a blind of some kind if you want to get a photo of an owl. Barred owls, when hunting, don’t always pay attention to where they’re going. So please keep an eye out for them when driving. And if you happen to find one who’s injured or too weak to fly, the best course of action is to contact a raptor rescue organization immediately. These centers specialize in medical assistance to wild raptors, (owls, eagles, hawks & falcons), and are the birds’ best chance of survival. And please remember, raptors are equipped with very sharp beaks and talons, so if you must move a bird off the road or to a safer space, be sure to use heavy gloves, and a thick towel or blanket, and call for help right away. 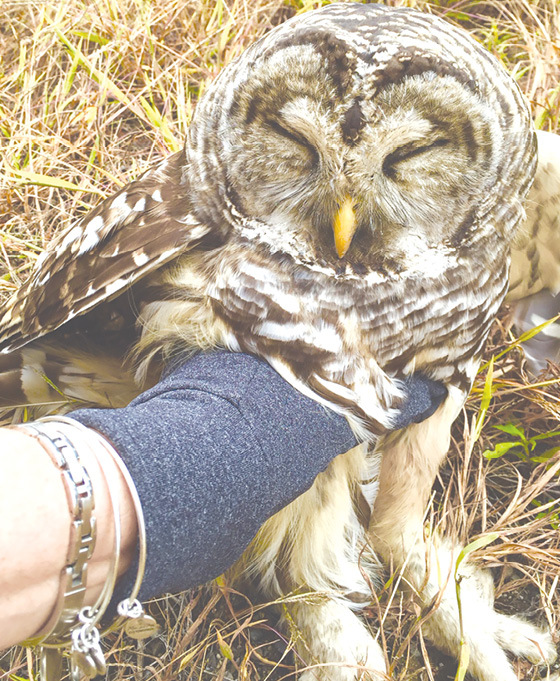 Being rescued in Maine, this owl closes his eyes. On a trip to Maine I came across an injured barred owl. At the time, I didn’t know what to do so I called the police/911. I asked if they had an Animal Control officer available, and they did! He arrived within 15 minutes and delivered the bird to the nearest raptor rescue organization. The outcome was excellent – the owl survived! We have so many owl enthusiasts in Suffield, here’s to hoping we can help these beautiful birds make it through a very difficult winter! Here are some of the raptor rescue organizations who will respond in case of an emergency: A Place Called Hope – 203-804-3453, 860-575-9791; Wild Wings – 203-637-9822; Christine’s Critters – 203-557-3192, 203-856-5596; Wildlife in Crisis – 203-544-9913.